Over the weekend we had a chance to visit beautiful Sunny Southern California. Back in Los Angeles to visit some family, it was a wonderful weekend with lots of fun with family and friends. Near our hotel we took a walk along streets in the South San Fernando Valley. It was so nice to see things blooming that I won’t have bloom until mid summer. The roses were in full bloom and just beautiful. So many colors of Knock Out Roses putting on a wonderful display. Come along on my walk. This was a street near our hotel. I couldn’t take a shot without Palm Trees and a glimpse of the rolling hills in the background looking toward Mulholland. A Date Palm along our walk. This tree was heavy with dates, albeit rather small ones. I wonder if they were really sweet? Not enough Palms? Here are several more in someone’s yard. They are beautiful and tall and graceful. These are the kind I like. Across the street from our hotel was this beautiful pink flowering tree. At first I thought that this was a Jacaranda Tree, but Jacarandas are more lavender in color and not as pink. I don’t know what this one is. When I lived in California, I never learned to identify many of the trees and shrubs there. This little shopping center housed my old hang out, Jerry’s Famous Deli, were I had my old favorite breakfast of scrambled eggs with onions, lox and bagels and tomatoes on the side. With a toasted bagel, of course. It also had a Western Bagel shop with the best bagels in Los Angeles. I’m in heaven. But enough of food, this is about flowers. Like I said, the Roses were really putting on a real show this year. This little Rose bed was just lovely. And this Pink Rose was just spectacular. David Austin – maybe. It was beautiful. 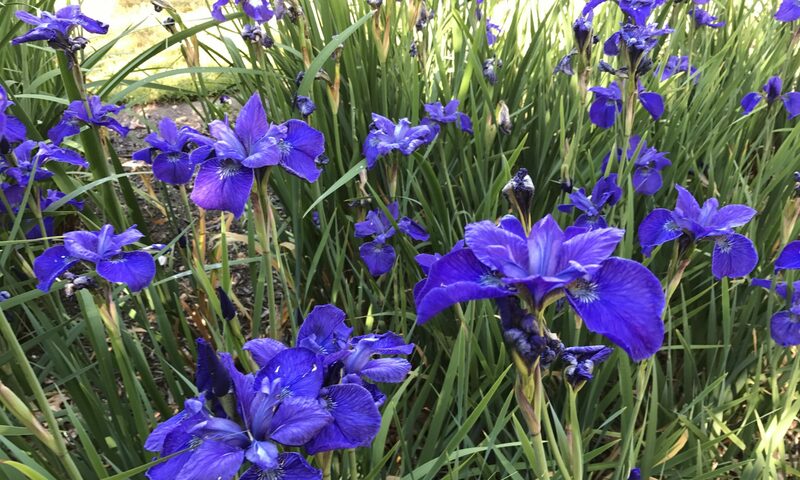 Some kind of Iris. This made a mass of striking, spiky foliage set with tiny blue flowers. Along the way, we found this lovely little Cactus Garden in someone’s front yard. The design was very nicely done. I really miss having Bouganvilla, which abound in Southern California. (It’s too cold here.) This red one is striking against the house. I do have one I keep in a pot, but it doesn’t put on nearly the display as ones in the ground. Another favorite of mine is the beautiful but Very Poisonous Oleander. This red one is just beginning to show color on its buds. As much as I like them, I would never have them around kids or pets. Another one that requires warmer weather than I have. A little away from the San Fernando Valley is Malibu. Here I am in a park overlooking the Pacific Ocean with a beautiful view of the hills. There were lots of Oaks, Scrub Brush, Ceanothus, Euphorbias, various kinds of Grasses and flowers. Elsewhere, I had seen quite a few Manzanitas, some really big ones too, which would be perfect for this dry, hot climate. It is only April, but everything is incredibly dry and already turning brown. Much too early for this time of year. LA has already had some fires, I fear this will be a bad year for them. This was a pretty Lavender Colored Flower I saw in the park. The flowers looked a little like Lantana, but they weren’t. I’m really rather sorry I never learned to identify plants better when I lived in So Cal. I might have been able to tell what this one was. Ahhh! And here is a view of the Pacific Ocean from the park. This was a lovely view. There were some people surfing out in it, although this is a little away from the public beaches. Of course, there was a nice breeze and not too hot. A perfect day! I had a great time in LA and fun with the grandkids and friends, but now it’s back to the Pacific Northwest, where it is cooler, but without the summer blooming flowers, yet. Thanks and thanks for stopping by. I’m glad you had a good time. Great shots! I never thought I’d see palm trees up close, but they are everywhere here in New Zealand! The other colors and views are just amazing. Thanks and thanks for coming by. I have never been to New Zealand. I would like to someday. Thanks for coming by. Glad you did. I’m glad you are having signs of spring up there in Alberta. Great to see the diversity of the different gardens. I love seeing the different palm trees!!! Beautiful pictures. You were in my neck of the woods 🙂 Hope you had a fabulous time! Thanks for taking us on such a lovely walk. I love seeing all of the beautiful flowers. Sure hoping that we don’t have another terrible fire season. Thanks for sharing with SYC.